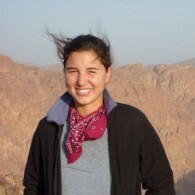 Adrienne Clermont graduated from Princeton University in 2009 with a BA from the Woodrow Wilson School and a certificate in Near Eastern Studies. Following graduation, she worked for the UN World Food Programme in Benin as a part of the Princeton in Africa fellowship program. She has since worked for Tomorrow’s Youth Organization and the International Youth Foundation on youth development programs in Palestine, Egypt, Jordan, Morocco, Algeria, and Tunisia. In 2015, she completed her MSPH in nutrition and international health at the Johns Hopkins Bloomberg School of Public Health. She currently lives in Baltimore and is a researcher at the Johns Hopkins Bloomberg School of Public Health. Madison Marks joined the MENAR Fellowship Program in 2016. She is currently based in Dubai working as Program Manager with Womena, aiming to increase gender inclusion and diversity projects in innovation and tech entrepreneurship across MENA. She also consults on projects at the nexus of tech and development. Prior to relocating to Dubai, Madison managed youth engagement programming for Qatar Foundation International in Washington, DC and also has experience with USAID, Bayt.com, Middle East Entrepreneurs of Tomorrow, World Justice Project, ANERA, and New Jordan Research Center. She holds a Masters of Arab Studies from Georgetown University's School of Foreign Service, a BA in Middle East Studies from Florida State University, and studied abroad in Jordan as a Boren Scholar in 2011-2012. Colleen McCullough got her BA from Princeton in 2012 and her JD from Penn Law in 2016. In 2008, she spent three months traveling in North Africa and Turkey. While at Princeton, she studied Arabic and took classes on the modern Middle East. She spent the summer of 2010 working at an orphanage in Egypt and the summer of 2011 working for the National Council on US-Arab Relations in Washington, DC. In 2016, she worked with the International Development Law Organization and the government of Somalia to rewrite the country's criminal code. She is currently works as a lawyer in Boston. Benjamin Lutz graduated from Elon University in 2017 with a BA in International Politics concentrating on Middle East Studies, Interreligious Studies, and Peace Studies. He then immediately moved to the United Kingdom and graduated in 2018 with an MA in Middle East Politics and Security Studies from the University of Bradford. During his undergraduate studies, he was twice awarded the Critical Language Scholarship in Arabic to study in the Middle East. He spent half of both of his degrees in the Middle East speaking Arabic and researching on Middle East geopolitics. Grant Smith graduated from The George Washington University in 2018 with a BS in Economics and Politic Science. At GW, Grant helped to expand and run the No Lost Generation Student Initiative, both at the local and national level. After university, Grant moved to Cairo, Egypt where he is currently working as a Presidential Associate at the American University in Cairo in the Office of Management and Transformation. In the summer of 2017, Grant studied in Dubai as a Clinton Scholar at the American University in Dubai, where he got his first chance to focus exclusively on Middle East politics, religion, and economics. Several Princeton students began the project of creating MENAR Fellowship Program, then under the name Princeton in the Middle East, in the fall of 2011. Gavi Barnhard and Colleen McCullough placed the first fellow in Morocco in 2013-2014, under the auspices of Princeton in Africa. Gavi Barnhard graduated from Princeton University in 2013, majoring in Near Eastern Studies with a certificate in Arabic Language and Culture. While at Princeton, he studied Arabic and took classes on Islam and the Middle East. He spent the summer of 2011 in Tunisia studying Arabic through the Critical Language Scholarship, and the summer of 2012 working for the American Enterprise Institute in Washington, DC. After graduation, he spent a year studying Arabic on a Center for Arabic Study Abroad (CASA) fellowship in Amman, Jordan, and has worked as a research assistant at the Washington Institute. Zach Ruchman graduated from Princeton University in 2010 with a BA from the Woodrow Wilson School and a certificate in Near Eastern Studies, and also studied at the American University in Cairo and the Hebrew University of Jerusalem. He completed his MBA at the University of Virginia Darden School of Business, where he was a Jefferson Fellow. Previously, he was a senior consultant at Alvarez & Marsal in Washington, DC. Zach has also worked at the National Democratic Institute, where he supported democracy development programs in Egypt and North Africa, and was as a Fulbright Fellow in Jordan, where he taught English at Jordan Applied University and was a researcher for the Project on Middle East Democracy.